A few months ago, artist and healer Helina Metaferia posted a series of six images that were equally striking, absurd, beautiful, and disturbing. They stopped me in my tracks. 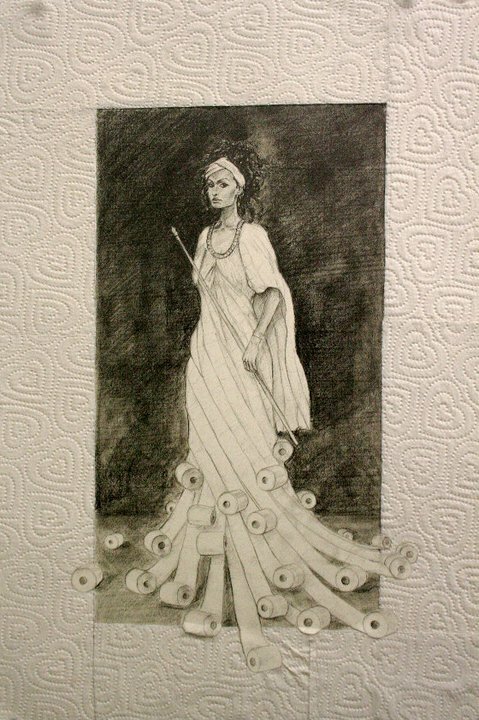 The infamous Queen of Sheeba was draped in rolls of toilet paper. 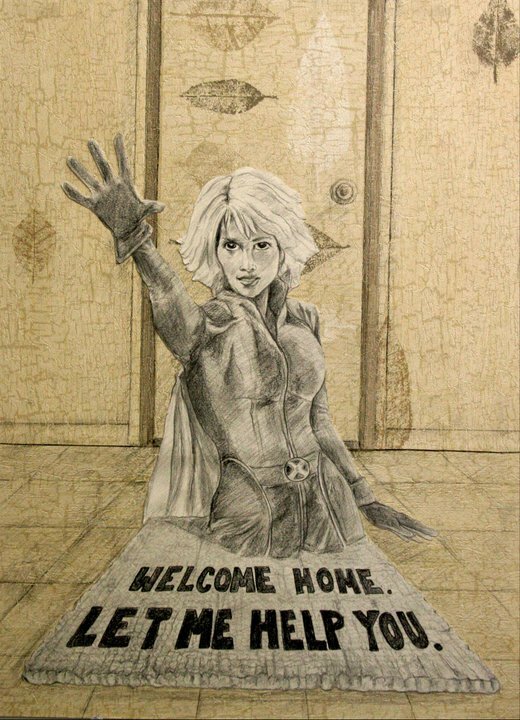 The X-Men’s Storm was nothing but a doormat. 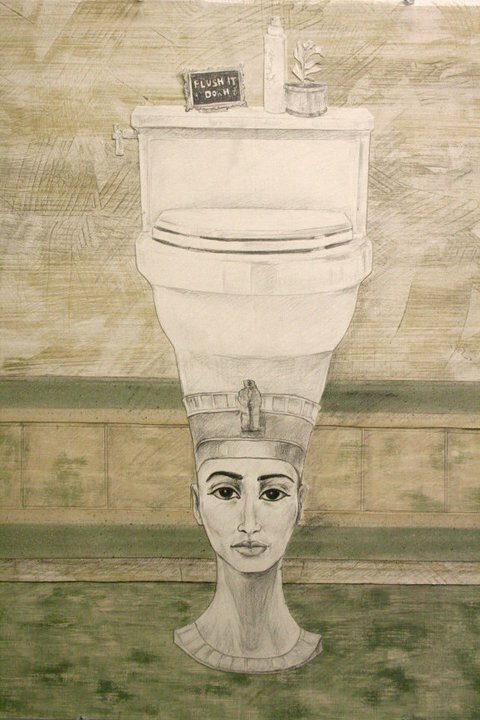 Nefertiti’s regal crown was instead the extension of a “porcelain throne.” Our mighty goddesses and fearless sheroes had been stripped of their strength, becoming everyday household objects… both useful and useless. The six images in Metaferia’s “Compositions of Disempowerment” series are a whimsical twist on the meaning of womanhood from an artist who is known for her vivid interpretations of femininity. What inspired you to create this series? 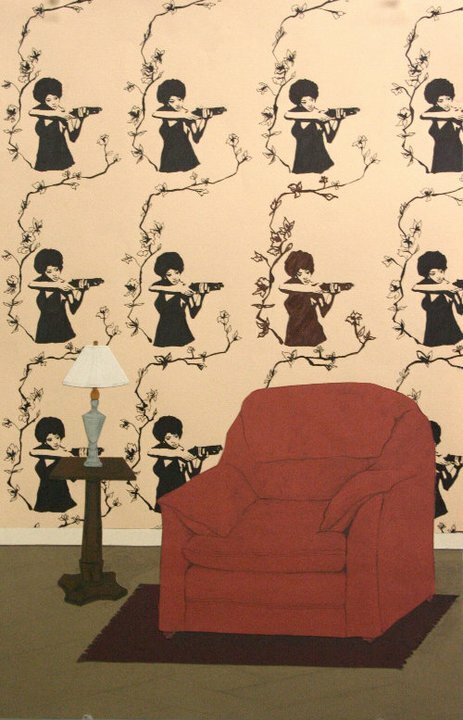 I created the series, titled “Compositions of Disempowerment,” because I wanted to touch upon the shadow side of the women’s self-empowerment movement. Often times, modern women work to embody the goddess, the queen, or the superhero by aspiring to be our innate inner diva. Those who have taken pilgrimage into self-esteem, in a society that still demoralizes women, often find that it is a complex journey. A woman can feel empowered among friends but enter a professional boardroom and feel inferior. Or, she can feel strong when she is at her job but then feel like a pushover in a controlling relationship. In my art, I’ve identified several archetypes of powerful goddess women and placed them in degrading disfigured positions. I did this to express the current universal complexity of women’s liberation. Most of my art describes the process of women’s soul development from a much more gentle and loving perspective. I usually work with themes of light and spiritual progression. This series is meant to show a painful side to the journey of self-love. Sometimes pain is part of the process, depending on which way your path turns. Is there meaning behind the six icons that you chose and the positions you placed them in? I chose symbolic powerful women that I have looked up to while growing up. I loved the sassy power of Pam Grier, the infinite potential of Storm from X-Men, and the regal grace of Nefertiti. All the women that are in the art had aspects that I would mentally melt together and draw strength from. I decided to deform them into household objects that were used and discarded, such as a doormat or a toilet, to illustrate the feeling of being equally divine and degraded. Women are still considered leaders of household work, so I chose to disfigure the sheros into objects that placed them back in the home. In your artist statement you write, “One may have the mindset of a queen, superhero, or goddess, but can have the actions of a doormat. True power develops from centering yourself in your role and never giving up your inherent abilities at the expense of yourself.” This can be so much easier said than done! For some people, it can take a lifetime to learn this lesson. What do you think is one action that women can do to begin stepping into their power? Everyone is different. Know your own strengths. Know your own weaknesses. Don’t be afraid of your own shadow. Know that every circumstance has a purpose that can direct you to a higher path, even the ugly circumstances. I think being willing to face yourself in the mirror and acknowledge the good, bad, and in between is the first step. We are all works in progress. But if we are able to get to know ourselves and love ourselves unconditionally, we will begin to eliminate some of the subconscious stuff that attracts self-sabotaging situations. A woman who truly loves herself is less likely to attract an abusive relationship or surround herself with haters. We can always point fingers and blame other people for our lack of empowerment all day long, but I’d rather take responsibility, which is the first step to gaining your power back. What do you hope people, especially women, will take away from the works? The beautiful thing about art is that I could have a certain intention, but it does not matter, because the viewer is going to internalize things differently anyway. I create art as an attempt to express myself and self-heal. I don’t expect others to have the same experience with my art as I do. That’s the beauty of fine art as opposed to commercial art. Fine art can be pretty selfish. I hope people get out of it what they need to. It may upset some, disturb others, and still, some people may relate to the images. All reactions are welcome, because at least they are reacting. Do you plan to add any more of our sheroes to the series? I have more art from this series that is not on the website. They can be viewed upon request in my art studio or at gallery shows. I am also planning to do some installation work to compliment the two-dimensional art. Is there a particular work in the series that speaks to you, your experiences, or your vision the most? I think every work in this series touches on the mixed feelings of empowerment gone wrong. I created the body of art because I needed to address the painful side of the self-empowerment journey. I am still creating in this series, and simultaneously am creating work that describes the brighter side of the journey. Both stories needed to be told because they help me grow. As I evolve, so does my art. Each piece of art that I birth tells a story about me. But like children, they grow up to be their very own, unique energies and will have their own relationship to the world. How do you feel about the “Compositions of Disempowerment” series? Does it speak to your own journey toward self-love? Helina Metaferia is a Maryland-based mixed media and healing artist as well as the founder of The Meta Experience, “a visual and healing arts company that provides creative wellness services.” Explore more of her work at HelinaMetaferia.com, and if you’re in the DC-area on September 17th, say hello at Helina’s Open Studio Tour! You’ll get a special opportunity to chat with the artist and view her latest artwork, with select pieces priced at 50% off. You won’t want to miss this event! Click here for more details.